This protocol describes a technique used to model Zika virus infection of the developing human brain. Using wildtype or engineered stem cell lines, researchers may use this technique to uncover the various mechanisms or treatments that may affect early brain infection and resulting microcephaly in Zika virus-infected embryos. Salick, M. R., Wells, M. F., Eggan, K., Kaykas, A. Modelling Zika Virus Infection of the Developing Human Brain In Vitro Using Stem Cell Derived Cerebral Organoids. J. Vis. Exp. (127), e56404, doi:10.3791/56404 (2017). The recent emergence of Zika virus (ZIKV) in susceptible populations has led to an abrupt increase in microcephaly and other neurodevelopmental conditions in newborn infants. While mosquitos are the main route of viral transmission, it has also been shown to spread via sexual contact and vertical mother-to-fetus transmission. In this latter case of transmission, due to the unique viral tropism of ZIKV, the virus is believed to predominantly target the neural progenitor cells (NPCs) of the developing brain. 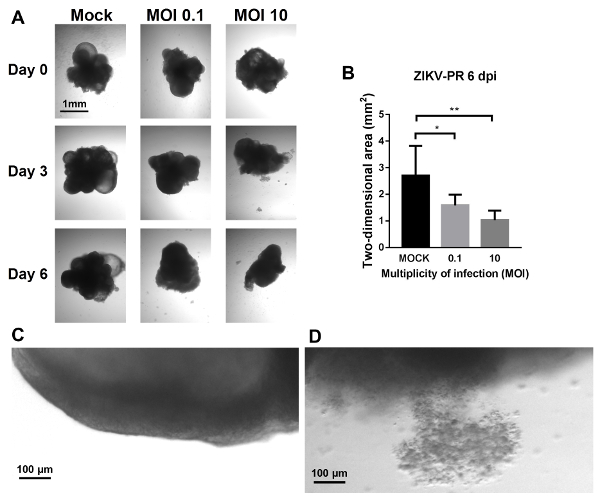 Here a method for modeling ZIKV infection, and the resulting microcephaly, that occur when human cerebral organoids are exposed to live ZIKV is described. The organoids display high levels of virus within their neural progenitor population, and exhibit severe cell death and microcephaly over time. 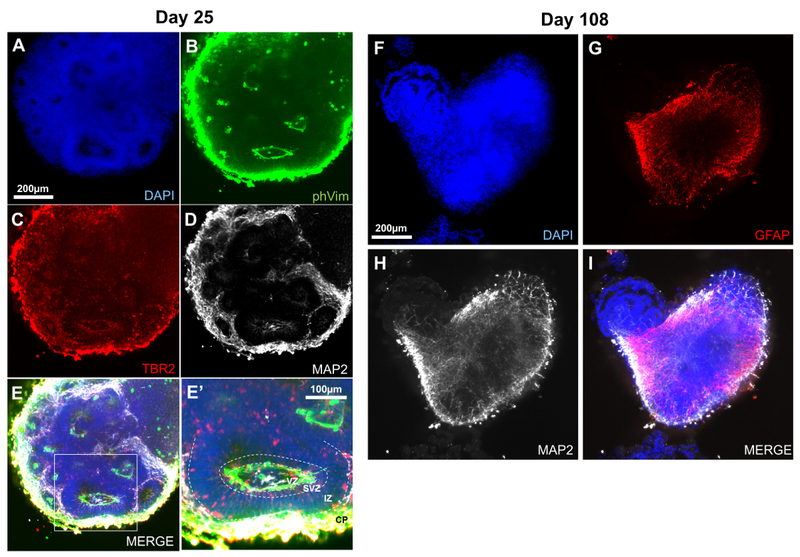 This three-dimensional cerebral organoid model allows researchers to conduct species-matched experiments to observe and potentially intervene with ZIKV infection of the developing human brain. The model provides improved relevance over standard two-dimensional methods, and contains human-specific cellular architecture and protein expression that are not possible in animal models. Zika virus (ZIKV) has rapidly spread in Micronesia, French Polynesia, and the Americas, and has recently been shown to cross the placental barrier1,2 to infect the developing fetal brain, leading to neurodevelopmental diseases such as microcephaly3,4,5,6 . The long-term impact on these patients' lives, and the current lack of treatment, has led researchers and clinicians to scramble for a better understanding of the mechanisms behind ZIKV infection and replication. Previous studies have examined ZIKV infection of in vitro systems in a variety of physiologically-relevant cell types7,8,9, as well as in vivo10 with immunocompetent and immunocompromised mice11,12,13 and non-human primates14,15,16. In addition to these more conventional techniques, several groups have implemented stem cell-derived cerebral organoids to understand more about ZIKV infection of the developing human brain. These groups have utilized human cerebral organoids to confirm the microcephaly phenotype17,18, investigate receptors linked to virus entry19, examine physiological responses to infection20,21, and potentially screen for drug candidates22. Here a technique for rapidly producing and infecting stem-cell derived cerebral organoids is described, as shown previously19, to improve the understanding of ZIKV infection of the developing human brain. Since the organoids are formed from standard pluripotent stem cell (PSC) cultures, this technique allows for a variety of scientific questions to be answered regarding viral infection of the developing brain. For example, CRISPR engineering may be used to modify these PSC lines prior to organoid infection at a faster rate than most in vivo genetic studies19. Additionally, unlike in standard two dimensional (2D) differentiation cultures, organoids exhibit the complex cellular architecture that is critical for corticogenesis, and recent studies have shown that this architecture may be disrupted upon infection21.Finally, the relatively low cost of generating organoids allows for higher throughput experimentation and screening when compared to in vivo models. On the other hand, there are some disadvantages to the utilization of organoids to study ZIKV. While organoids are far more biologically relevant than 2D cultures, there are additional challenges in the assessment of organoids due to their three-dimensional (3D) nature. Imaging and dissociation of organoids tends to involve more equipment and a larger investment of resources than in standard 2D cultures. Additionally, organoids lack the vasculature and immunological components that are present in in vivo models, so researchers interested in those aspects of viral infection are advised to seek an alternative protocol. There are a number of techniques for the formation of human organoids and neurospheres in culture, and they typically fall within the patterned or unpatterned categories. Patterned methods implement factors to regulate Wnt, BMP, TGFβ, and other signaling pathways to push differentiation toward specific lineages23. Unpatterned methods, such as the one described here, take advantage of the propensity for induced pluripotent stem cells (iPSCs) and human embryonic stem cells (hESCs) to differentiate toward a neuroectodermal lineage by default24. After approximately three weeks of differentiation, the resulting organoids consist of large, biomimetic neuroepithelial structures that contain several cell types that are observed in the early developing brain. The technique for producing organoids from standard, feeder-free PSC cultures, and infecting these organoids with ZIKV is presented in full. For guidance on the culturing methods needed for feeder-free PSCs, please refer to previous methods publications25,26. Additionally, in order to apply consistent amounts of virus for multiple experiments, it is important to calculate the MOI ahead of time. This is done by conducting an infection of Vero cells, followed by treatment with overlay medium, incubation, and immunostaining. Descriptions and methods of this technique have been previously described19,27. Once the PSC culture reaches the target confluence of 50%-70%, the cells are then dissociated and aggregated into ultra-low attachment 96-well plates. The cells are maintained for 3 days in xeno-free stem cell maintenance media (SCMM), and then converted to a neural induction media for the remainder of the culture. Once the organoids have differentiated for 3 weeks, the infection can be conducted. By routinely taking images during the week following infection, researchers will observe progressive cell death and disruption of the organoid. Researchers may also dissociate the organoids at this time to conduct transcriptional or proteomic profiling. Cryosectioning and lightsheet methods are recommended for imaging, and researchers can expect to see high levels of infection and viral replication particularly within the neural progenitor cell (NPC) populations in the organoids. Ultimately, this technique allows researchers to rapidly examine the mechanisms of viral infection of the human brain with low cost and limited equipment. Note: This protocol assumes that stem cell (SC) maintenance is conducted in SCMM medium with a vitronectin or Geltrex substrate. If using an alternative, high-protein stem cell culturing media, it is advisable to transition SC cultures to SCMM for at least two passages before initiating organoid formation. The protocol has not been tested with feeder-based SC culture methods. Using regular SC maintenance methods25,26, bring cultures to 50%-70% confluence. This is typically 3-4 days after passaging, though this can be dependent on culture method and cell line. Note: Approximately 2 wells from a 6-well plate are needed to produce a full 96-well plate of organoids. Inspect cultures via brightfield microscopy at 10X-20X magnification to ensure healthy colony morphology, with no detectable differentiation. Bring SCMM to 37 °C in a hot water bath, and thaw a 50 µL vial of 50 mM Y-27632 (Rock inhibitor) and 2 mL of enzymatic detachment reagent to room temperature. Prepare an ultra-low attachment (ULA) U-bottom 96 well plate, a multichannel P200 pipette, and a 25 mL reagent reservoir. Aliquot 45 mL of SCMM in a 50-mL conical tube, and add 45 µL of 50 mM Y-27632. Mix thoroughly by triturating. Vacuum aspirate the two wells containing SCs, and quickly add 1 mL of enzyme-free detachment reagent to each well using a P1000 pipette. Incubate the plate in a 37 °C incubator for 4 min. Vacuum aspirate the treated wells, and add 1 mL of enzymatic detachment reagent to each well using a P1000 pipette. Incubate the plate in a 37 °C incubator for an additional 5 min. Remove the plate and examine the treated wells. Gently tap on the plate to break up aggregated cells. If large cell clusters are still visible, incubate the plate for 2 additional min at 37 °C. Repeat this step until clusters are no longer visible by the naked eye. Once the cells are properly dissociated, add 1 mL of SCMM to each well to deactivate the dissociation enzymes. Pool the 4 mL of cell suspension in a 50-mL conical tube and take a small aliquot for cell counting. Return any remaining, untreated wells in the maintenance plate to the 37 °C incubator. While counting, centrifuge the cell suspension at 300 x g for 5 min. Determine the total number of cells, and calculate the amount of SCMM + Y-27632 solution that will be needed to achieve a 60,000 cells/mL suspension. Carefully vacuum aspirate the supernatant and add the calculated volume of SCMM + Y-27632 solution. Mix 5-10 times with a 5-mL pipet, ensuring a uniform cell suspension. Immediately transfer the cell suspension into a reagent reservoir, and pipette 150 µL into each well of the ULA U-bottom 96-well plate using a multichannel P200 pipette. This produces 96 individual organoids, each initially consisting of 9,000 cells. Centrifuge the plate at 150 x g for 1 min. Place the plate into a 37 °C incubator, and do not disturb the plate for 48 h.
Prepare 17 mL of SCMM with 17 µL of 50 mM Y-27643 in a 50-mL conical tube. Warm the SCMM + Y-27632 solution to 37 °C in a hot water bath. Take the organoid plate from the incubator, and using a multichannel P200 pipette set to 75 µL, slowly draw up medium from the edge of the well on the first row. Once the medium has been drawn, quickly expel the medium back into the well to lift up loose cells and organoids. Repeat this for each row. Note: This technique, hereafter referred to as a "dispersion," lifts cellular debris and the organoid into suspension. The organoid rapidly sinks to the bottom of the well, while the smaller debris remains in suspension, allowing it to be removed with a media change. This helps to prevent the organoid from resting in cellular debris during culture. After all wells have been dispersed, wait for 15 s to ensure that the organoids have sunk to the bottom of each well. Slowly and carefully aspirate 75 µL of medium from each well using the multichannel P200 pipette and dispense into a waste reservoir. Note: Most users occasionally aspirate an organoid during regular feeds. This can occur roughly 1% of the time. Please plan accordingly to ensure that enough organoids survive to experimental time points. Transfer SCMM + Y-27632 solution into a reagent reservoir, and dispense 150 µL into each organoid well using the multichannel P200 pipette. Place the plate back into a 37 °C incubator. Warm 17 mL of SCMM to 37 °C, this time without Y-27643. With the multichannel P200 pipette set to 100 µL, disperse all wells of the organoid plate (see step 2.2). Wait 15 s to ensure that organoids have sunk to the bottom of their wells. Prepare a waste reservoir and transfer warmed SCMM into a source reservoir. Carefully aspirate 125 µL of medium from each well, and replace with 150 µL of fresh SCMM using the multichannel P200 pipette. Note: Conduct this regular maintenance every other day until infection. Before beginning the feed on day 4, prepare Neural Induction (NI) medium. Thaw a 250 µL aliquot of 2 mg/mL heparin, along with one 5 mL vial of 100X N-2 Supplement. Add the 250 µL of heparin, 5 mL of 100X N-2, and 5 mL of 100X MEM-NEAA to 500 mL of DMEM/F12+GlutaMAX. Sterile filter the mixed solution in a 500 mL filter. Note: Keep NI at 4 °C when not in use; NI lasts up to two weeks before fresh medium should be prepared. Warm 17 mL of NI medium to 37 °C. Prepare a waste reservoir and transfer warmed NI into a source reservoir. Carefully aspirate 125 µL of medium from each well, and replace with 125 µL of fresh NI using the multichannel P200 pipette. NOTE: After approximately 3 weeks of differentiation, there will be large neuroepithelial structures and rosettes visible within the organoid that will be highly susceptible to ZIKV infection. Bring Earle's 1X Balanced Salt Solution (EBSS), 1X PBS, and NI to 37 °C in a hot water bath. Dilute ZIKV of known concentration in 1X EBSS to the target infection multiplicity of infection (MOI). Note: Titrations of different MOIs are recommended to achieve a viral dose response. This may vary by virus strain; for ATCC VR-1838 and ATCC VR-1843, typical MOI values range between 0.1 and 10). Carefully remove all medium from organoid well using a single channel P200 pipette. Quickly add 200 µL of 1X PBS to each well using a P200 multichannel pipette to wash the organoids. Carefully remove all medium from organoid well using a single channel P200 pipette. Quickly add 50 µL of 1X EBSS-only (mock infection) or ZIKV virus solution to well and ensure that the organoid is completely submerged. Repeat for each organoid that is to be infected for the study. Place the plate back into a 37 °C incubator for 2 h.
Note: Incubating mock-infected organoids for this duration should not significantly impact their growth as compared to undisturbed organoids. Approximately 30 min before viral incubation is completed, aliquot 25 mL of NI into a 50-mL conical tube, and bring to 37 °C in a hot water bath. After viral exposure is completed, wash the organoids with 200 µL of 1X PBS for each well, allow organoids to settle for 15 s, and then remove 1X PBS using a single channel P200 pipette. Add 200 µL of fresh NI to each well, and place back into the incubator. Optional: For a day 0 time point, organoids may be imaged one hour after infection. Continue to culture by replacing 125 µL NI every other day using the dispersion method (see step 4). Be sure to properly dispose of spent media and tips, as this contains infectious ZIKV particles. During the day of organoid formation, SC cultures should be in the log-growth phase, in which they are 50%-70% confluent, as shown in Figure 1(A-C). Cultures should form rounded colonies with distinct edges, and the wells should be clear of differentiation Figure 1(D-E). 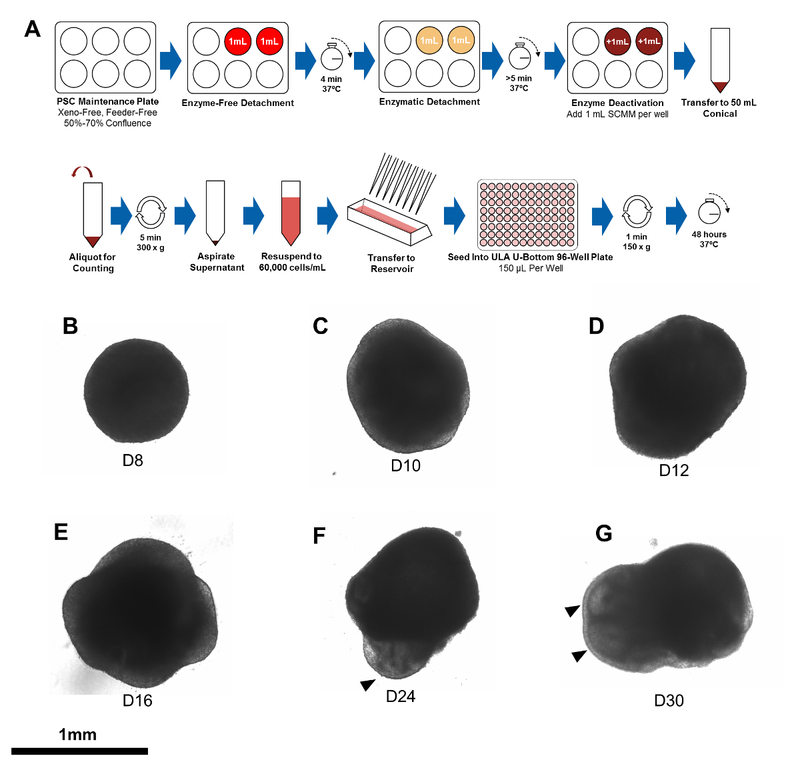 If differentiation is occurring, it is recommended to conduct a pick-to-remove to clean the affected areas within the plates at least one day prior to creating organoids. If a large portion of the culture is differentiated, it may be necessary to conduct an extra passage, thaw a new vial, or alter stem cell culture techniques to ensure that the organoids are being formed by pure stem cell cultures. The dissociation by a combination of enzyme-free and enzymatic detachment reagents treatment should lead to mostly single cells, though there may still be small aggregates of cells observed during counting. The presence of small aggregates does not appear to disrupt organoid formation, though it may affect counting accuracy. It is recommended that multiple counts are made per sample, and if the counts vary by over 20%, it may be necessary to increase dissociation time to singularize cells further. Once the cells are seeded and spun down in a ULA U-bottom 96-well plate (Figure 2A), they will appear as a flat, dense sheet of cells on the bottom of each well. The cells will slowly aggregate over the next two days. It is best not to disturb the plate during these 48 hours, as mechanical forces may disrupt the loosely-formed aggregate. For the first 10 days, the organoid will remain mostly spherical, and will grow from ~300 µm to 600-800 µm (Figure 2B). More observable structures begin to appear in the organoid between day 10 and day 20(Figure 2C-E). By day 24, researchers should be able to observe rosette-like structures via brightfield microscopy (Figure 2F). While continuing the culture, these neuroepithelial structures may increase in quantity and size over several days (Figure 2G). During feeds, the researcher will notice considerable amounts of debris collecting on the bottom of each well, particularly during the first 2 weeks of culture. The dispersion technique described in step 2.2 removes most of this cellular debris to prevent the apoptotic debris from accumulating over multiple feeds (Figure 3A). This debris can interfere with imaging, it can make it more challenging to observe and quantify infection-induced cell death, and it may provide asymmetric signaling to the neighboring organoid that could affect differentiation. If the dispersion technique is properly conducted, this should be reduced (Figure 3B-C, 3D-E). It is recommended to conduct cryosections or lightsheet imaging to inspect the cortical structure forming within the organoids. 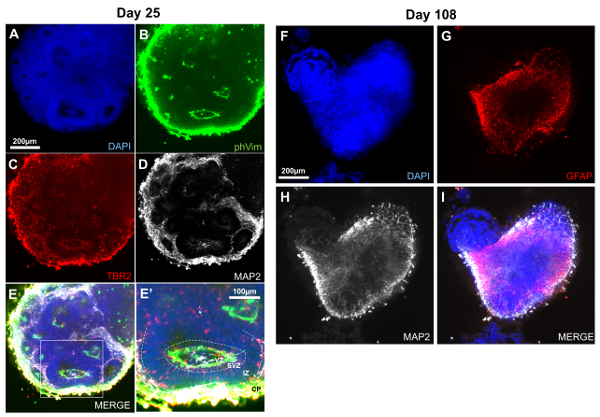 In day 25 organoids, the rosette structures and ventricular zones are clearly visible in DAPI (Figure 4A) and phospho-vimentin (Figure 4B) staining. The presence of TBR2 (Figure 4C) indicates that intermediate progenitors are forming, with a morphology that suggests outward migration. MAP2+ (Figure 4D) neurons populate the outer regions of each rosette. From these proteins, one can visualize the ventricular zone (VZ), subventricular zone (SVZ), intermediate zone (IZ), and cortical plate (CP) within each rosette (Figure 4E,4E'). One can continue to culture these organoids in order to observe later stages of development. While cortical layering is not as prominent in this type of organoid, the natural switch to gliogenesis does occur much like it does in vivo. This can be observed in day 108 organoids, in which a large portion of the cells express either MAP2 or GFAP (Figure 4F-I). 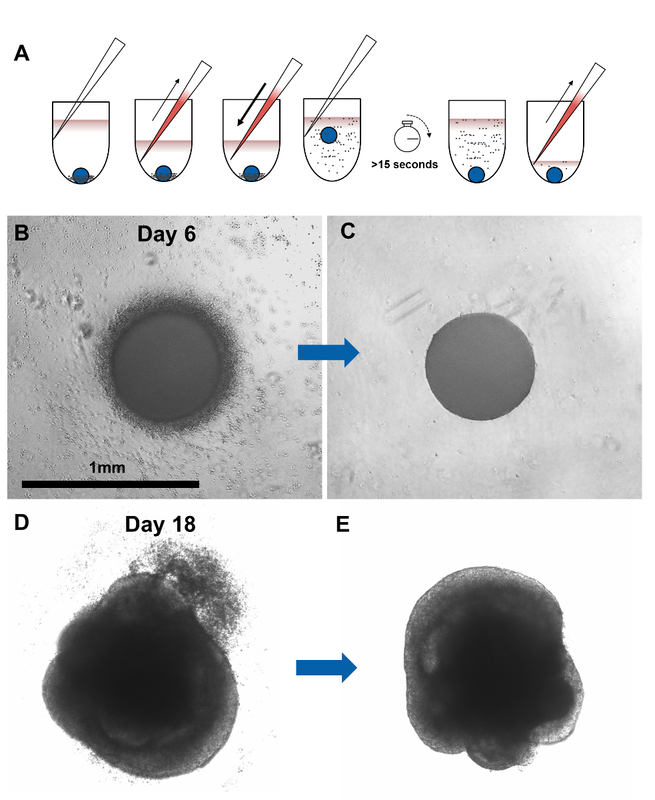 The users may expect to see differences in organoid size by approximately 3 days after ZIKV infection, depending on the viral MOI applied to the organoids (Figure 5A-B). After these 3 days, there will also be an increase in cellular debris in the infected wells compared to the mock wells. This difference in organoid size will increase over the following week, until the infected organoids begin to break apart (Figure 5C-D). A variety of assays may be used at this point to investigate infection mechanisms, including viral RNA extraction and cryosectioning (recommended antibodies reported in the Table of Materials). Upon cryosectioning, users will observe a large presence of virus in the apical region of neuroepithelial structures, suggesting a susceptibility of neural progenitor cells (NPCs) to ZIKV infection (Figure 6). Immunofluorescence of sectioned organoids will also show an increase in cleaved caspase-3 expression in the infected organoids (Figure 7). Figure 1: Stem cell colony morphology prior to organoid formation. Colonies should be 50%-70% confluent at the time of dissociation to produce a large number of consistent organoids. (A) Sparse, recently-seeded cultures have not yet reached log-growth phase, and will not produce many organoids. (B) Once the cells reach the proper confluence, they are ready for dissociation. It is also important that these colonies are inspected to ensure that they are clear of differentiation. (C) Colonies that are taken too far will reach over-confluence and are not recommended for organoid formation. Cultures in this state are more likely to contain differentiating cells. (D) Colony edges should be distinct, with consistent cell morphology of rounded cells in the center, and slightly elongated cells toward the edges. (E) Minimal differentiation should be present in the cultures. If larger, flattened cells are observed in the centers or edges of colonies (white arrowheads) and make up more than roughly 1% of the culture, it is recommended that pick-to-remove or additional passages are conducted to form a uniform stem cell population. Please click here to view a larger version of this figure. Figure 2: Cerebral organoid growth over time. (A) A diagram for the production of cerebral organoids from 2D PSCs maintained in xeno-free, feeder-free medium. (B) For the first 8 days, organoids will remain mostly spherical with few detectable features. The diameter of the organoid will range from approximately 300 µm to 500 µm. (C-E) At day 10, clearer regions will start to be detectable around the periphery of the organoids, and they will lose their spherical shape. They will continue to increase in size to approximately 1 mm in diameter, depending largely on the cell line being used to produce the organoids. (F) After approximately 20 days of differentiation, users will observe the formation of neuroepithelial structures (black arrowheads) in the clear peripheral regions of most organoids. These have a ring-like morphology, with apical and basal structures mimicking those of the developing cortex. (G) These neuroepithelial structures will continue to grow and increase in size for approximately 20-30 days. Please click here to view a larger version of this figure. Figure 3: Clearing of cellular debris via dispersion feed technique. During organoid growth, a large amount of cell death is to be expected, and can lead to accumulation of cellular debris surrounding the base of the organoid. (A) The depicted dispersion technique allows researchers to remove most of this debris during each feed. To do this, using a multichannel P200 pipette, slowly draw up the used medium and rapidly expel it to lift the organoid and cell debris into suspension. The organoid will quickly drop to the bottom of the well, at which time a regular feed can be conducted. Examples of a day 6 organoid before (B) and after (C) dispersion feeding shows considerable debris reduction. This continues for several weeks, as shown by a day 18 organoid before (D) and after (E) dispersion feeding. Please click here to view a larger version of this figure. Figure 4: Characterization of cerebral organoids via immunohistochemistry. Lightsheet images of cerebral organoids are shown to provide an example of the cellular architecture that forms. At day 25, DAPI (A) and phosphor-Vimentin (B) indicate individual rosettes and the ventricular zones, respectively. (C) TBR2 labels intermediate progenitors that are migrating outward, and MAP2 (D) labels neurons that have formed in the cortical plate. (E,E') The combination of these proteins clearly shows the recapitulation of cortical development in the cerebral organoid models. (F-I) By day 108, gliogenesis has occurred, with a mixture of GFAP+ and MAP2+ cells populating much of the organoid. VZ = ventricular zone, SVZ = subventricular zone, IZ = intermediate zone, CP = cortical plate. Please click here to view a larger version of this figure. Figure 5: Degradation of infected organoids. 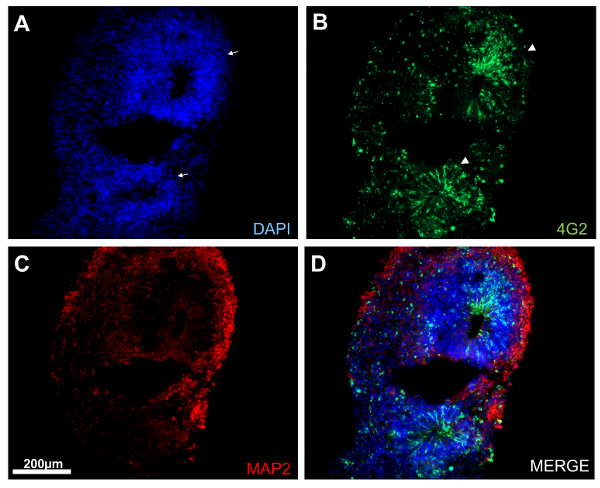 (A) Bright field images of Mock and ZIKV-infected cerebral organoids at MOI = 0.1 and 10. Images were taken immediately after infection (Day 0), as well as 3 and 6 days post-infection. (B-C) Brightfield images of the cell debris surrounding (B) mock and (C) ZIKV-infected at MOI = 10 cerebral organoids 3 days post-infection. Please click here to view a larger version of this figure. Figure 6: Cryosection and immunofluorescence of infected organoids. Day 24 organoids were exposed to ZIKV at MOI = 0.1, and cryosectioned 6 days later. At this stage, there is a clear presence of virus in the ventricular, subventricular, and intermediate zones of the organoid, where neural progenitor cells and radial glia reside. (A) Via nuclear staining, these neuroepithelial regions are clearly visible due (white arrows) to the high density of nuclei that form ring-like structures around the apical surface. (B) By staining for the viral envelope, one can observe a relatively high presence of virus within these rosette structures (white arrowheads). Note that there is a small amount of virus present in various unidentified peripheral cells. (C-D) MAP2 or other neuron-specific stains show that there are neurons present in the cultures that do not appear to be infected by the virus when overlaid with the viral stain. Please click here to view a larger version of this figure. Figure 7: Cleaved caspase-3 immunofluorescence of infected organoid. After infection, one may use apoptotic indicators to investigate the mechanisms of cell death that occur within the organoids. In this example, day 24 organoids were exposed to ZIKV at MOI=0.1, and cryosectioned 6 days later. (A) Uninfected organoids show no viral envelope (4G2 protein), and a minimal amount of cleaved caspase-3 due to homeostatic apoptosis occurring in the tissue. (B) Infected rosettes begin to show increased levels of apoptosis. (C) Rosettes that are showing severe infection via 4G2 staining also tend to exhibit high levels of cleaved caspase-3 in these regions. There is a direct correlation between infection severity and cleaved caspase-3 expression within the infected rosettes. Please click here to view a larger version of this figure. There are several caveats to consider when utilizing human cerebral organoids to investigate ZIKV infection. One important consideration is that organoid formation and structure is highly dependent on the stem cell line from which they are formed. Take care when comparing between cell lines, including isogenic engineered lines; it is best to make conclusions using multiple subclones, and ideally multiple stem cell lines. Additionally due to this difference in cell lines, pilot experiments to ensure that proper differentiation is occurring in the organoids is recommended. While the neuroepithelial structures are visible by brightfield microscopy, it is also suggested to conduct qRT-PCR or cryosectioning experiments to look for neural differentiation markers such as PAX6 or phospho-vimentin. One should also anticipate considerable variability among organoids within the same cell line. Due to the unpatterned nature of the protocol, the number and size of neuroepithelial structures can vary between individual organoids. Typically, one can expect at least two large (>200 µm in diameter by D24) neural rosettes per organoid. For this reason, longitudinal studies, such as the observation of change in organoid size upon infection, are particularly enlightening. Variability between batches may also occur, with the most likely cause for this being inaccurate cell counting or seeding. It is recommended to conduct multiple counts and to make sure the cell suspension is well mixed before seeding onto the ULA U-bottom 96-well plates. When culturing organoids in ULA U-bottom 96-well plates, plan on seeing considerable evaporation effects around the edges of the plates. It is ideal to fill these wells with PBS and only work with the center 60 wells. Due to the evaporation, organoids in the outer wells will be exposed to different conditions than those in the center, which will likely affect their growth and differentiation. Please consider this when planning the number of organoids that will be needed for experiments. Additionally, organoids will begin to overgrow the 96-well format after roughly 30 days, which will be visible due to the discoloration of culture medium. If planning on taking the organoids past the 30 days, it is recommended to transfer the organoids to a ULA 24-well plate. To conduct the transfer, use scissors to cut a P1000 tip so that the opening is much larger than the organoids themselves, and transfer the organoids by pipetting. Human cerebral organoids hold great potential in advancing the field's understanding of neurodevelopment and disease. Researchers are encouraged to modify the protocol as necessary. For example, one could implement patterning factors to improve differentiation efficiency toward specific cell types, allowing them to explore the viral impacts on certain anatomical regions. The neurodevelopmental effects of ZIKV are still poorly understood, but this new approach will give researchers an accessible, rapid, and high-throughput way of investigating the mechanisms of infection. The authors thank Priscilla L. Yang and Dominique J. Burri of Harvard Medical School for help with initial propagation and quantification of ZIKV. We also would like to thank Nathaniel D. Kirkpatrick for imaging support. K.E. was supported by the Stanley Center for Psychiatric Research and the Harvard Stem Cell Institute. Jurado, K. A., et al. Zika virus productively infects primary human placenta-specific macrophages. JCI Insight. 1, 1-6 (2016). Quicke, K. M., et al. Zika Virus Infects Human Placental Macrophages. Cell Host Microbe. 20, 83-90 (2016). Brasil, P., et al. Zika Virus Infection in Pregnant Women in Rio de Janeiro - Preliminary Report. New Engl J Med. 375, 2321-2334 (2016). Mlakar, J., et al. Zika Virus Associated with Microcephaly. New Engl J Med. 374, 951-958 (2016). Rubin, E. J., Greene, M. F., Baden, L. R. Zika Virus and Microcephaly. New Engl J Med. 374, 984-985 (2016). Soares de Oliveira-Szejnfeld, P., et al. Congenital Brain Abnormalities and Zika Virus: What the Radiologist Can Expect to See Prenatally and Postnatally. Radiology. 161584 (2016). Hamel, R., et al. Biology of Zika Virus Infection in Human Skin Cells. J Virol. 89, 8880-8896 (2015). Tang, H., et al. Zika Virus Infects Human Cortical Neural Progenitors and Attenuates Their Growth. Cell Stem Cell. 18, 587-590 (2016). Xu, M., et al. Identification of small-molecule inhibitors of Zika virus infection and induced neural cell death via a drug repurposing screen. Nat Med. 22, 1101-1107 (2016). Morrison, T. E., Diamond, M. S. Animal Models of Zika Virus Infection, Pathogenesis, and Immunity. Journal of virology. 00009-00017 (2017). Lazear, H. M., et al. A Mouse Model of Zika Virus Pathogenesis. Cell Host Microbe. 19, 720-730 (2016). Manangeeswaran, M., Ireland, D. D. C., Verthelyi, D., Tonelli, L., Wang, V. Zika (PRVABC59) Infection Is Associated with T cell Infiltration and Neurodegeneration in CNS of Immunocompetent Neonatal C57Bl/6 Mice. PLOS Pathog. 12, 1006004 (2016). Miner, J. J., et al. Zika Virus Infection in Mice Causes Panuveitis with Shedding of Virus in Tears. Cell reports. 16, 3208-3218 (2016). Dudley, D. M., et al. A rhesus macaque model of Asian-lineage Zika virus infection. Nat Commun. 7, 12204 (2016). Li, X. -F., et al. Characterization of a 2016 Clinical Isolate of Zika Virus in Non-human Primates. EBioMedicine. 12, 170-177 (2016). Osuna, C. E., et al. Zika viral dynamics and shedding in rhesus and cynomolgus macaques. Nat Med. 22, 1448-1455 (2016). Cugola, F. R., et al. The Brazilian Zika virus strain causes birth defects in experimental models. Nature. (2016). Garcez, P. P., et al. Zika virus impairs growth in human neurospheres and brain organoids. Science. 352, 816-818 (2016). Wells, M. F., et al. Genetic Ablation of AXL Does Not Protect Human Neural Progenitor Cells and Cerebral Organoids from Zika Virus Infection. Cell Stem Cell. 19, 703-708 (2016). Dang, J., et al. Zika Virus Depletes Neural Progenitors in Human Cerebral Organoids through Activation of the Innate Immune Receptor TLR3. Cell Stem Cell. 19, 258-265 (2016). Gabriel, E., et al. Recent Zika Virus Isolates Induce Premature Differentiation of Neural Progenitors in Human Brain Organoids. Cell Stem Cell. 20, 397-406 (2017). Qian, X., et al. 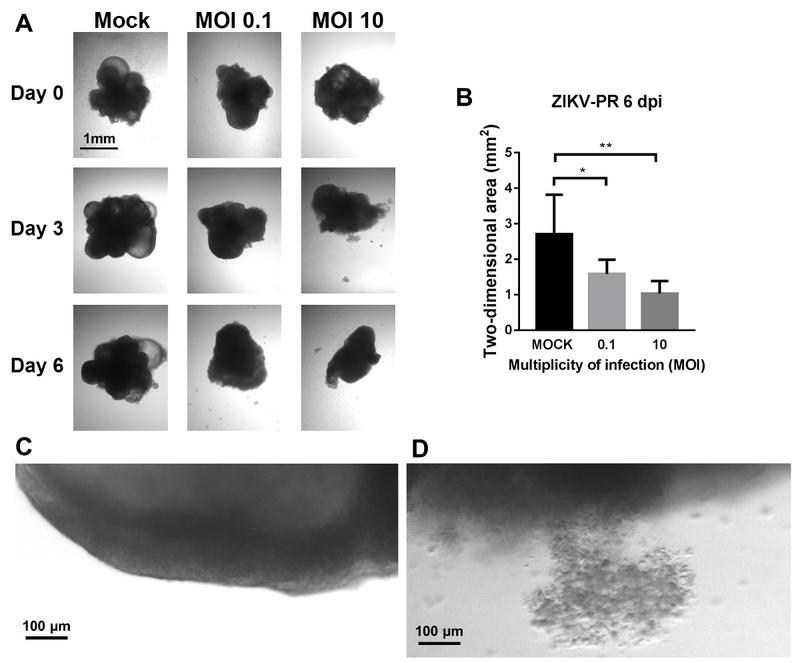 Brain-Region-Specific Organoids Using Mini-bioreactors for Modeling ZIKV Exposure. Cell. 165, 1238-1254 (2016). Lancaster, M. A., et al. 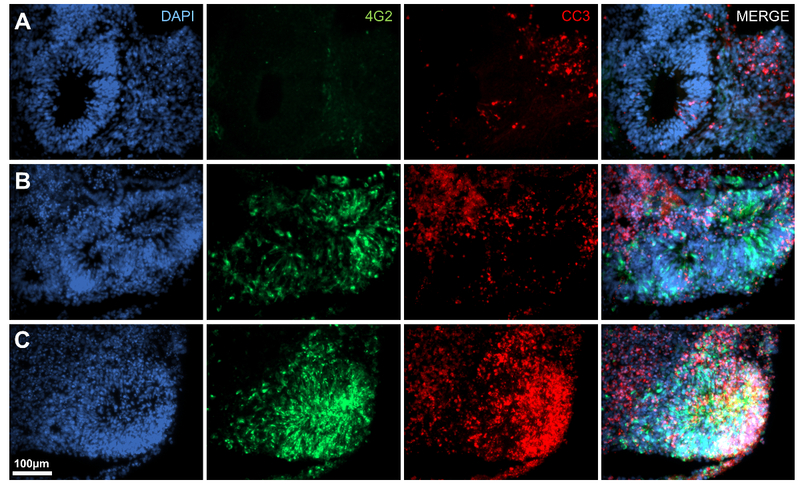 Cerebral organoids model human brain development and microcephaly. Nature. 501, 373-379 (2012). Chen, G., et al. Chemically defined conditions for human iPSC derivation and culture. Nat Methods. 8, 424-429 (2011). Beers, J., et al. Passaging and colony expansion of human pluripotent stem cells by enzyme-free dissociation in chemically defined culture conditions. Nat Protoc. 7, 2029-2040 (2012). Contreras, D., Arumugaswami, V. Zika Virus Infectious Cell Culture System and the In Vitro. Prophylactic Effect of Interferons. J Vis Exp. e10-e13 (2016).